If you’re suffering from angel withdrawals now that the Unearthly series has ended, might I suggest the Mercy series by Australian author Rebecca Lim? It’s definitely among the more thoughtful angel books that I’ve read, and has a most unusual premise: Mercy has no memory of her life before, and wakes up in different human bodies that she must help. One of the things I find unusual and fascinating about this series is the way Mercy hands out punishment to the wicked with such terrible justice. With the U.S. release of the second book Exile releasing this month, we’ve invited the author to share her experience in writing about divine beings who aren’t necessarily perfect. It’s been tricky, writing about angels. Questions of faith and religion are intensely personal and when your heroine is a fallen angel, you need to step delicately or risk treading on someone’s beliefs because angels crop up in so many faiths and cultures across the globe. It seems these days you can’t turn around without falling over an angel book, but when I was pitching Mercy, Random House actually turned me down on the basis that they’d just signed a book called … Fallen (!) Why all the angel books? Well, I think authors like Phillip Pullman began a trend of “secularising” angels – making their fictional portrayal less of a taboo subject – but I also think that the very lack of source material about angels meant they were ripe to be made over, the way other supernatural beings like vampires and werewolves have been. It’s interesting, too, how instantly recognisable angels are. They are part of our global, collective “dreaming,” if you like. We live in a dark, complex, densely-layered world. Every person harbours secrets and dreams and flaws. Writing gives me a way of trying to make sense of things in this world that have no answers: like why bad things happen to good people, and vice versa. Mercy is different from the exiled angel protagonists I know of because she’s female and not especially “hot.” She’s bad-tempered and not especially likeable either, because she keeps “waking” to find herself inhabiting a stranger’s body with no memory of how she got there. And then she just has to survive, and live that person’s life for a while, and right wrongs and fight demons, before she’s pulled out again and plonked into someone else. In Mercy, I consciously set out to create a female heroine who can, literally, do anything if she puts her mind to it. I wanted to show that it’s okay to be a smart-mouthed, think-on-your-feet, strong and abrasive, yet empathetic character, who also happens to be female. Mercy’s life – and the life of the girl she’s collided with – may be in utter chaos, but despite everything that is thrown at her, she may be forced to bend, but she will never, ever break. I wanted to create a female heroine who looks outwardly very weak, but who could actually dish out vengeance to her persecutors. The Mercy books are a kind of empowering revenge fantasy, I guess. For once, I wanted some small measure of justice to be meted out in the name of wronged women; because so often in the real world, the perpetrators of crimes against women get away with it, or get off far too lightly. What if, over time, she began to regain her supernatural powers but she felt less and less like an angel, and more and more like a human? How can a supernatural being even fathom, let alone come to appreciate, the kind of humanity that is antithetical to her own nature? I thought it would make for an interesting character, a different kind of fictional female character. And I thought it might also be interesting for the reader to walk in the shoes of a damaged, amnesiac being who is literally thrown into a stranger’s life and forced to live it. Mercy’s story is the imaginary history of a being of pure spirit who finds herself inexplicably entrapped in the physical, sensory world. And it’s also a self-contained YA mystery/crime novel that just happens to feature a hint of romance, Latin, choral music and a whole lot of choir nerds (I used to be one, so I can say that). I wanted to layer my angel series so that it wasn’t just the typical “high school” scenario where you have mean girls and jocks etc. I wanted to shake it up a bit. The series is also a fictional response to some terrible abduction and imprisonment stories involving young women that were emerging around the time I was writing the novels. The news is a potent trigger for book ideas. The stuff people do to each other in real life is staggering. With the Mercy books I was hoping to reach YA readers and female readers generally because of some of the themes I cover. It isn’t a fair world for women by a long stretch. Many of us are daily discriminated against, enslaved, abused, ill-treated, purely on the basis of our gender. As a female reader, there’s nothing wrong with wanting to identify with the fictional female heroine, but as a female writer, I start getting enraged when what I’m reading doesn’t begin to reflect the gains and diversity that is life in today’s world. It’s 2013. Women can save themselves. Women are not defined by the romantic love triangle they might happen to find themselves entangled in. It’s fantastic that YA literature is increasingly being populated by strong female role models, but there need to be a lot more. It’s my personal belief that writers have a duty to put positive reflections of the sisterhood out there. Enough horrific stuff happens to women in the real world. Women writers, in particular, should be empowering women readers to not accept traditional stereotypes; even in fictional portrayals of women. We should be counteracting – with all the tools we have available to us as writers – the darkest aspects of human nature. So Mercy is a female hero who isn’t defined by who her boyfriend is, or how her hair looks, or whether she’s hanging with the cool kids at school. It’s not everyone’s cup of tea that she seems rude, cold, bad-tempered and not particularly girly, but I’m happy that she’s different. And if you are along for her journey and embrace Mercy’s manifold flaws the way I have? I thank you, I really do. Rebecca Lim is a writer and illustrator based in Melbourne, Australia. 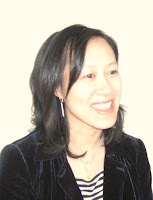 She worked as a commercial lawyer for several years before leaving to write full time. Rebecca is the author of fourteen books for children & young adult readers, & her novels have been translated into German, French, Turkish and Portuguese. The second book in the Mercy series, Exile, will be out in the United States from Disney Hyperion on April 23, 2013. It will be available through Amazon, The Book Depository, Fishpond, and other retailers. 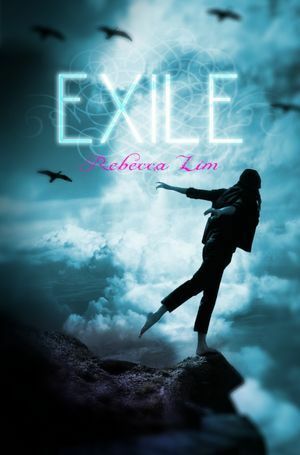 Rebecca’s next standalone YA novel is due to be published in the first half of 2014 by Text Publishing; US release date to follow. Thanks to our friends at Disney Hyperion, we have a lovely advance readers copy of the US edition of Exile to give away. All you need to do is leave a comment below telling us why you’re excited to read this book, and to fill out the Rafflecopter form with your details. Open internationally to readers aged 18 and older, or 13 and older with parental permission; complete rules are on the entry form. Good luck! i haven’t read books by rebecca lim before…but they sounds great !!! These books sound very interesting! Congratulations to the winner! ^^ Thank you to the bloggers here for everything they do and all the wonderful giveaways they have! I like bad-tempered and smart-mouthed angels, another series to my wishlist. Thanks for the recommendation. The premise of the story seems very interesting. I never heard of this series so I will go look for it at my book store. Thank you for recommending something new! Besides being a readaholic, I’m a quilter. I learned about wabi-sabi in the mending of garments. Truly the stuff of life. Love your feminist philosophy, even if that’s not always such a positive term. Sounds like a books I’d definitely enjoy. I like the idea that she’s waking up in someone else’s body – reminds me of Every Day (which I haven’t read but want to). I don’t read alot of angel books but I’m interested in this one. I enjoy reading new authors, and I am pulled in my the cover and summary. I liked the idea of a flawed heroine, because in a lot of books the heroine is ridiculously perfect and I don`t like it. The character seems realistic. To me, a character is more complete, more beautiful, more memorable and interesting, if they are flawed. Oh, I couldn’t agree with this more. I was trying to explain this to someone recently actually and couldn’t quite put it into words. A fantastic post from Rebecca! Thanks so much for sharing. It’s frustrating to me when characters are so perfect that you just want to scream, hah. I think Mercy’s flaws make her more interesting, particularly since she is an angel. I want to say that I did read the first book in this series. It is a series right? That means, I need to read this book soon. It is a series! 2 more books to come after this one, 4 overall. The others have actually already been released overseas. I bet you’d enjoy this, Savy. It’s true, I never thought it would be difficult to write about angels in this way. But you’re right. I have Mercy sitting on my shelf, but I have not yet had the chance to read it. I have heard very opposing opinions about the book, but something about it makes me want to give it a shot. So I might as well have the next book sitting on the shelf when I get done and am jonesing for the next one! It’s interesting to me to see the different reactions to Mercy, too. I hope you end up liking her, Jaime! Look forward to hearing your thoughts when you get around to reading the books. I already kind of loved Rebecca Lim and Mercy, especially looking back on the book, but now I love them both even more and want to read Exile just as much as I want to see my cat (which is a lot). Can I keep them? I wish I’d appreciated Mercy more when I read it! Wasn’t this guest post great? I will be reading the series with new eyes now. I hope you get a chance to read the book AND see your cat, AP! Hah. I’m not really a fan of angels novel but this book seem to have a different concept! And how the heroine isn’t all flawless is very interesting to me. I also love the plot line how she wakes up in different bodies – like you said, sounded unusual. I’d definitely love to read this one. It’s a lot of unusual concepts combined in a way that really work, in my opinion. :) Definitely not your typical angel series, so I hope it ends up being a good reading experience for you. Oh GOD I need to read Rebecca Lim’s series after reading this post. All the stuff on empowering women in books… yes, yes, yes. It almost hurts to agree with something this much. I want to see this SO BADLY. In real life the most, but I’ll settle for seeing it in fiction until it starts to happen in real life. And I want people to stop being annoyed at strong characters (and legislators/newscasters/actresses) just because they’re female. If I enjoy the books half as much as I enjoyed reading this post it will be money well spent. Also the premise sounds really good. Oh man, the justice that Mercy serves is one of my favorite things about the books, Walrus. It’s quite….biblical. Let me know what you think of Mercy when you get around to reading it! While I didn’t really fall in love with Mercy, Wendy, this post is fabulously written. I love the idea of wabi-sabi; the world would be pretty boring if everything and everyone was perfect. Ah, will you be giving the sequel a try? I am very curious as to how Mercy will develop as a character and where her story goes. And yes, it was fascinating to read about Rebecca’s wabi-sabi influence. I like the twist on the Fallen Angel idea. I haven’t read a lot of angel stories but this one sounds really unique. A more realistic, flawed character sounds like it will add depth to the story as well. …especially since the fallen angel is female! I love that, and I hope you will, too. An excellent, thoughtful guest post! I’m very curious about the first book now, I’ll have to see if my library has it. I hope so, Book Queen! Maybe they’ll order it for you if it’s not in stock. I often have to do that with my local branch–they’re tiny. Flawed characters are always some of the most funnest to read, and the schpeel that the author did introduces an intriguing concept and an interesting voice. I’m a big sucker for angels, but all the YA books I’ve read so far have been really sucky, to say the least. All angst and deep soul-searching gazes and passion that really doesn’t go with what I believe angels should be. I think a lot of angel books miss the whole POINT of angels, you know? They should have some sort of higher purpose, and per your comment, it’s weird when they’re mostly angsty and selfish and wander around not doing very much. 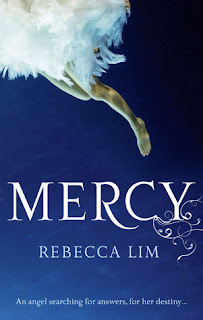 I read Mercy by Rebecca and loved it! I thought it was a distinctive YA novel with an angel theme and I love strong, independent young women who can achieve anything with the right motivation and mindset! I am really interested in hearing what you’d think of this series, Keertana. Not everyone responds to it, but certain readers will appreciate Rebecca’s more subtle, thoughtful approach. Hope you get a chance to try the books, Erin! I liked Mercy. I should keep reading. I looove this cover btw. Yes, you should. :) And I love the cover, too, it’s very moody and beautiful. What an awesome guest post! Mercy sounds like a great character. I like that she is flawed. It also sounds like a really cool story that she ends up in other people’s bodies. I do agree that there needs to be more strong female heroines, and I definitely think, that in YA especially it’s getting there. Flawed characters are so much more interesting to me than Mary Sues! You’re right, we are seeing some interesting YA heroines recently, which is a very good thing. I am very intrigued by the angel in exile thing, too. We still don’t know much about that yet, but I have a feeling things will get ratcheted up in book three or four. Angels? Japan? Are you kidding me? I’m a super fan of Asian culture. I definitely want to read this one! You have painted a beautiful picture of this main character. I’m currently to show similar characteristics in my female lead in my work in progress. Thanks for giving me a little more insight into creating a character like this! I love the way you have painted the picture this girl. I’m struggling in my writing to create a similar character in my current WIP. Thanks for giving me a little more insight about female leads. I will definitely be reading this one. Strong female leads are always a pleasure to find. I hope you end up liking Mercy as much as I do! I hadn’t heard of Rebecca or this series before this post, but the concept of “beauty from imperfection” really grabs me. That is essentially the theme of my blog — “beauty from ashes.” I’d like to read a book in the same vein. Plus the cover art is awesome. I loved that, too–and what a beautiful name for a blog! And agreed, both the US covers are lovely so far. I’ve been wanting to get my hands on this series for a few months now. I always trust your opinions and when I saw that you enjoyed this I knew I’d need to read it. I usually stray away from Angel books. I tend to not like them as much. There are a couple exceptions. But I had a feeling this would turn out well, because she’s an Aussie author. Now I don’t love them all, but the ones I have loved, I mean I just can’t get enough of those. So, maybe there’s something in the water. Who knows, but this sounds excellent. I am pretty sure you’d like this, Vivien. I know you appreciate books that don’t always follow the cookie-cutter mold. Australia isn’t a huge part of the setting or story, but I do think there’s a subtle texture/quality to the writing that you may not find elsewhere. The “not being defined by your boyfriend” thing is so important to me, Jasprit. I’m sick to death of reading romances disguised as paranormal books. There’s nothing wrong with romances, mind you, but I don’t like having the wool pulled over my eyes if I’m expected an actual story about angels. I hope you like Mercy, Jasprit! Something that sounds this awesome passed over for Fallen? Tisk-tisk. I’ve never even heard of these books before (not surprising, given the market) but definitely sounds interesting. I’ll have to pick up the first book if I can find it. I hope you will give this a try! It’s a very interesting series, and unlike most of the other, more superficial angel books for sure. What a fabulous post! I really respect Lim’s thoughts on heroines and her motivation to write such strong, diverse characters. I really appreciated hearing her perspective on diversity and femininity, too–she’s clearly put a lot of thought into creating Mercy, as well as the messages she wants to send with her character. I love what the author said about creating a weak looking female character but making her one who could do anything that she puts her mind to. It sounds like this one would have a lot of action and I am definitely longing for a new angel series to get sucked into after saying goodbye to Clara! Thanks for bringing these ones to my attention, I hadn’t heard of them before! I hope you enjoy the books, Jenni! They’re not written in a typical wham-bam type of way, and the tone is more thoughtful–but that’s exactly what I like about them. Loved this very thoughtful post-Mercy was one of my favorite reads of 2011 and definitely is an atypical angel book that I’ve recommended. I really liked Mercy too, Bookworm–I’m very curious where the next two books will take the story! And agreed, it’s an atypical angel series for sure. In a good way. I love the concept of “wabi-sabi” — that’s a fantastic way of looking at the world. While I’m not the biggest fan of some angel worlds, I do agree that with what limited mythology there is, you can be as creative and diverse as you like with them. It’s amazing what you can learn from other cultures, especially mythology. I think all aspiring fantasy writers should do some extensive research in this area. I think angels are hard to write about, but when they’re done in a way that shows some research and respect for their roots (whether the story deviates or not), I think it can be a really interesting read. The angel books that don’t tend to work for me are the ones where they’re really just treated like supernatural beings who just happen to have wings. :/ Definitely not the case here!